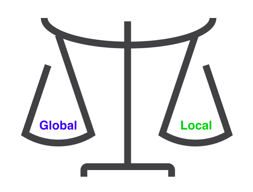 Recently we posted a blog that touched on the respective benefits of local versus global supply. We think it’s worth reiterating the benefits of each (separately and in combination) to an organization. As Supply Technologies sources many products from both global and local suppliers (billions of parts from more than 7,500 suppliers), we believe we have the expertise to know when a global supplier makes sense for a customer’s supply chain fulfillment, when a local supplier is more practical or beneficial, and when and how to blend the two for optimum supply chain performance and results. The global supply chain is not without challenges, such as exchange rate, time zone, language, flexibility, exchange rate, etc. However, the positive benefits can outweigh drawbacks. Global suppliers are able to react to changing political conditions that may transform a region from a great low-cost source to a high risk arm of their global network. Proximity to a customer’s markets means transportation costs of materials are lower and lead times shorter, sometimes dramatically. Engaging with a local supplier eliminates a number of potential barriers (language, time zones, shipping costs, communications, etc.) that can affect production and on-time delivery of products. Local suppliers are typically smaller enterprises and allow smaller minimum order quantities, requiring less of an up-front investment and less inventory on hand. Ability to react quicker and more efficiently to variable demand. The choice of global, local, or a combination of the two depends on a manufacturer’s needs relative to production facility locations, markets, and other factors; the best VMI programs evaluate dozens of data points to determine the best way to get quality materials to the customer on time and at the lowest cost, to put them at the most appropriate combination of quality, inventory, and cost.